In The Great Christ Comet, Colin R. Nicholl argues that the Star of Bethlehem was not, in fact, a star. Instead, as the title suggests, it was a comet, “undeniably the single greatest comet in recorded history.” To reach this conclusion, Nicholl blends a close reading of the Bible with careful attention to the astronomical record. The result is one of the most intriguing books you will read this year. Nicholl joins a long tradition of scholars who have written about Bethlehem’s star. Through the centuries, they have proposed a variety of answers to the question of its nature. Some have proposed that it was a star, of course. Others, the triple conjunction of Jupiter and Saturn in Pisces in 7 B.C. Occultations of Jupiter in Aries in 6 B.C. is a more recent suggestion, as are either a nova or supernova. Meteors get mentioned. Some think it may have been a supernatural phenomenon such as a mystical vision or an angel. Skeptics dismiss it entirely as a myth. By contrast, Nicholl affirms the historicity of the Gospel account of Jesus’ birth. He further argues that a comet can account for the star’s seemingly erratic behavior, appearing first in the eastern morning sky, then months later in the western and southern evening skies. Depending on the observer’s perspective, he points out, a comet can appear to stand still over a particular location as its speeds toward the nighttime horizon. …a narrowly inclined, retrograde, long-period comet that, around the time of its close perihelion, rose heliacally and thereafter crossed the Sun-Earth line to be on the western and eventually the southern side of Earth. Such a comet could account for the seemingly erratic behavior of Matthew’s star. In fact, its behavior was not erratic at all, but rather the predictable movement of an astronomical body along a predefined trajectory. I won’t recapitulate that entire argument here, interesting though it is. Instead, I will simply note that using Revelation 12:1 this way helps Nicholl arrive at a date: September 15, 6 BC. According to his astronomy software, on this date, “the Sun, making its way through Virgo, was located over her womb, while the Moon was under Virgo’s feet.” This was also the date of the Jewish New Year, which Babylonian astrologers would have known because of the Jewish diaspora in that region. …the Magi probably came to the conclusion that the great leader whose birth was being so dramatically announced in the heavens was the Messiah based on a number of key prophecies in the Hebrew Bible—particularly, Numbers 24:17; Isaiah 7:14; and 9:2. Together, these texts disclosed the identity, nature, destiny, and general location of the newborn. Interestingly, according to Nicholl’s astronomical calculations, the comet would have descended below Virgo on October 20, 6 BC, suggesting the actual birth of the royal baby. At some point after this, he argues, the Magi left on their weeks-long journey to Judea. Matthew 2 records what happened when they arrived. I cannot say that Nicholl’s cometary hypothesis has settled the question of the Star of Bethlehem’s nature once for all. Other than Matthew 2 (and possibly Revelation 12), extant historical records, which are admittedly spotty, make no reference to this comet. Nicholl’s use of Revelation 12 to establish a timeline is without doubt fascinating, but not the only — or even most obvious — way to read that passage. And the reconstruction of the comet’s duration, size, magnitude, and trajectory is conjecture, though a mathematically informed one. 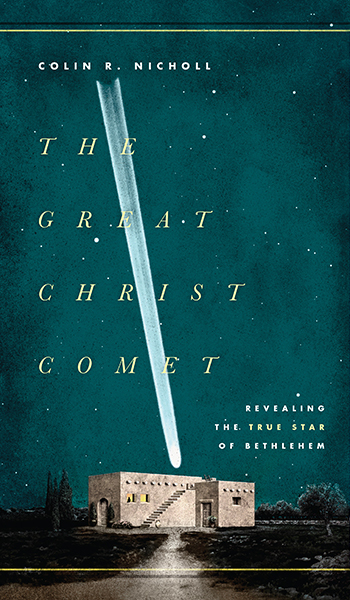 Still, Nicholl has provided an intellectually rigorous account of the Bethlehem star that honors the historical accuracy of the Bible even as it uses complex scientific calculations to outline its hypothesis. The Great Christ Comet thus provides plenty of grist for the mill for people with interests or training in the Bible and astronomy, not to mention the relationship of faith and science. (His publisher, Crossway, is a well-known conservative evangelical company, and his theology is in line with theirs.) Plus, the book is beautifully printed, with excellent charts and graphs scattered throughout to illustrate the points of Nicholl’s argument. In sum, The Great Christ Comet is a fascinating book, very well worth reading.